Two journalists have been threatened with jail time in Germany for publishing information about the extent of the country’s surveillance activities. 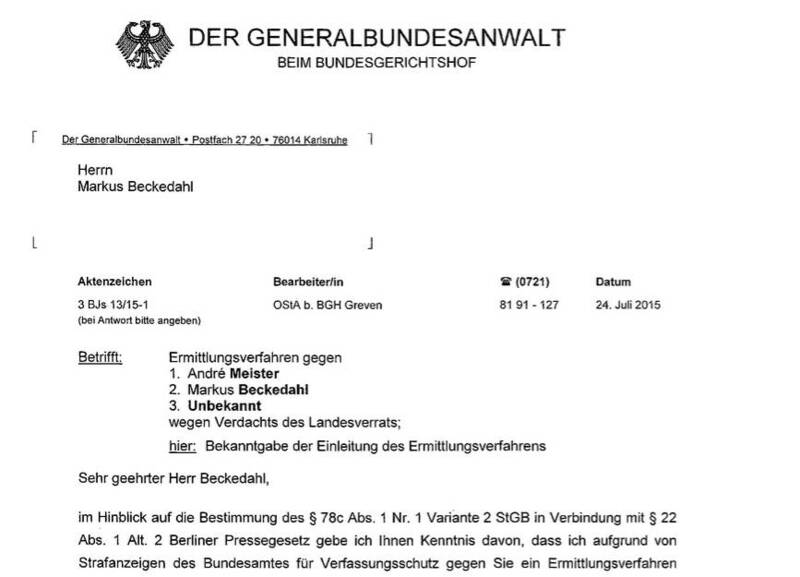 Markus Beckedahl and Andre Meister, editors at stick-it-to-zer-man activist website Netzpolitik.org, received a letter on Thursday informing them that they were under investigation for treason. The reason was two articles they published in February and April this year. The first (Deutsch) examined a €2.75m project for processing massive online data sets. The second revealed (English) plans for a 75-man unit to monitor Twitter and Facebook chats as well as other communications. In both cases Netzpolitik published leaked documents it had received in full. As El Reg reported in July, the confidential sources behind those leaks fell under investigation following a complaint by Germany’s interior spooks, the Federal Office for the Protection of the Constitution (BfV). Beckedahl and Meister were informed at the time that they were considered witnesses in the case, but now, according to the letter, the public prosecutor is looking at them as joint principals in the case. The last charge of treason, which carries the threat of jail time, was last used against journalists more than 50 years ago, in the Spiegel Affair of 1962. This goes someway to explaining the reaction in Germany over the matter. All major newspapers have reported the case and social media went into overdrive. Even Christian Lindner, leader of the Free Democratic Party of Germany (FDP), took to Twitter to say the freedom of the press was in danger. A street demonstration in Berlin is planned on Saturday. Meister said he would not be intimidated. Beckedahl told the TV network N24 he was “torn between feeling like this is an accolade” and worried about the real possibility of jail time. “The Federal Attorney General needs to drop the investigations against us and our alleged source(s) and instead investigate and charge out-of-control secret services, that are expanding their mass surveillance without public debate,” he continued.